Morrissey kicks off a new leg of his U.S. tour later this week. Today he announced three more dates including Chicago, Cleveland, and a Detroit area stop November 23rd at the Royal Oak Music Theatre. Hang on just a moment though, because there's a little drama with the Detroit area show (isn't there always?). The issue isn't that he's playing the Royal Oak Music Theatre -- apparently he's gotten over his 2011 beef with security. No, the problem here is Morrissey already has a November 23rd date scheduled in El Paso at the Abraham Chavez Theatre that is currently on sale! Looking at the tour itinerary it appears the El Paso show is either getting moved or it will be axed altogether. Updates on the fluid El Paso/Royal Oak Mozgate situation will be posted once available. The full tour itinerary, including the new dates, is posted below. 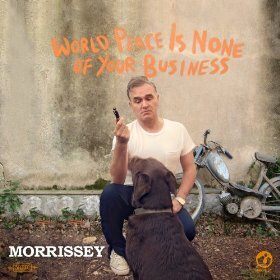 UPDATE (10/24 @ 4:07PM): Morrissey's November 23rd show in El Paso has been canceled. On sale info for the Detroit show will be announced shortly. UPDATE (10/25 @ 11:15) Tickets for the November 23rd show at the Royal Oak Music Theatre go on sale Friday at 10am. The pre-sale kicks off October 26th at noon.